How to Rebuild Credit after Declaring Bankruptcy | Machi & Assoc. If you have a good credit score (over 700), filing bankruptcy can push your overall credit score down by as much as 200 points. However, the impact that bankruptcy has on an average score is much lower; you can expect to lose about 130 points. If you’re like most people who file bankruptcy, your credit score is likely in the poor range. If this is the case, filing bankruptcy may have little to no effect on your score. In some cases, bankruptcy can actually give your score a boost by discharging your debts and removing past due balances. As mentioned, a bankruptcy can remain on your credit report for up to 10 years. During this time, it may be more difficult for you to obtain credit. However, the impact of bankruptcy lessens with time, and many people are able to apply for and obtain credit in spite of bankruptcy. If your goal is to have good credit or take out a loan someday, you must take steps to rebuild your credit. 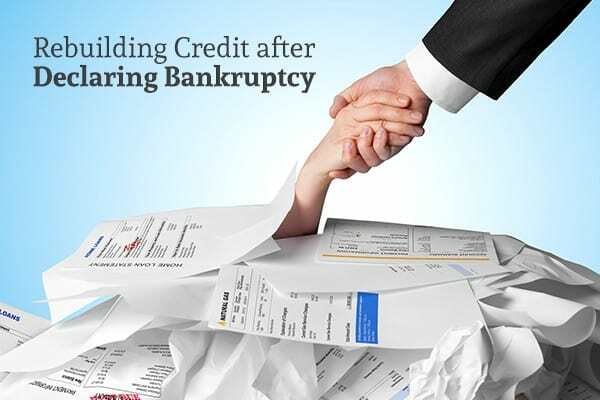 Once you’ve finished the bankruptcy process, you can begin to take steps to rebuild your credit. If you filed for Chapter 13 bankruptcy, making the agreed-upon payments on time and in full each month will go a long way in repairing your credit. The same is true if you filed for Chapter 7 bankruptcy and excluded some things from the bankruptcy, such as a house you’re still making payments on. Soon after your bankruptcy is finalized, you should obtain a credit card. You will find that your options are limited due to the bankruptcy, but you should be able to get a secured credit card without any issues. Even though you secure the card with your own money, it reports just like a regular credit card would. If you make payments on time, you will start to see your credit score slowly rise. You may receive a slew of credit offers after bankruptcy from unscrupulous lenders trying to benefit from your situation. In many cases, the offers carry exorbitant interest rates and are not worth it. What’s more, taking on too much debt right after bankruptcy can leave you in the same predicament you were before filing. Always make smart credit choices after bankruptcy. Doing so will get you back on the road to good credit much faster. Your credit score reflects more than your payment history; making payments on time is vital for a good credit score, but it isn’t all you should pay attention to. You should also pay attention to other factors that affect your credit score, such as credit utilization, mix of credit, and credit inquiries. Apply for credit sparingly and strive to maintain balances on your revolving accounts that are less than 30 percent of your credit line. Do not get a bunch of credit cards; instead, work toward a mixed credit profile that contains secured credit as well. The choice to declare bankruptcy is a personal one that carries hefty consequences. Before making your decision, make sure you understand your current financial situation and how bankruptcy will affect it. Furthermore, ask yourself if you have the discipline to rebuild your credit after filing. Bankruptcy can be a new beginning, but you must be willing to do the work. To learn more about how bankruptcy can help you, call Ted Machi & Associates today for a no-cost initial consultation.